Ulcers arise because the skin dies from inadequate provision of nutrients and oxygen. This occurs as a consequence of (a) oedema in the subcutaneous tissues with poor lymphatic and capillary drainage and (b) the extravascular accumulation of fibrinous material that has leaked from the blood vessels. The result is a rigid cuff around the capillaries, preventing diffusion through the wall, and fibrosis of the surrounding tissues. Arterial perfusion of the leg is usually normal or increased, but stasis occurs in the venules. 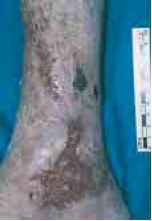 The lack of venous drainage is a consequence of incompetent valves between the superficial veins and the deeper large veins on which the calf muscle "pump" acts. 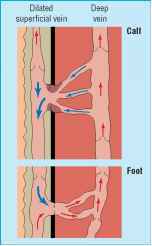 In the normal leg there is a superficial low pressure venous system and deep high pressure veins. 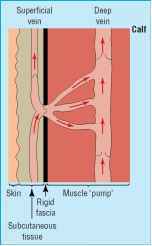 If the blood flow from superficial to deep veins is reversed then the pressure in the superficial veins may increase to a level that prevents venous drainage, Vancose veins with "back pressure" causing stasis and oedema. Mainly women get ulcers—2% of those over 80 have venous ulcers as a long term consequence of the factors listed above. Leg ulcers are more likely to occur and are more severe in obese people.